What an amazing wine town! 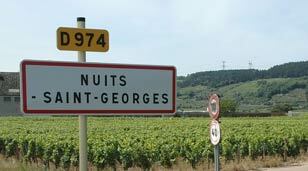 Nuits-St.Georges doesn't have a Grand Cru of its, which generally seems to lower prices across the board, so a Nuits Premier Cru will generally cost less than an equivalent Vosne or Chambolle. Yet these days, the quality is classy and consistent, and even if the wines can be a little rustic, its a very charming sort of rusticity. The proof is in the bottles, and this tasting was more consistent and interesting than our group's Pommard/Volnay and Clos de Vogeout tastings. Actually, the lineup included the best group of 2004 red Burgundies I've had yet. A mellow, laid back wine. Fragnant and light, tasty if not especially ponderous, hitting the taste buds with an almost ethereal essence of Bourgogne. Burgundy Wine Collection. If money isn't an issue, this is a food wine to drink on a regular basis. It's delicious and artisan without being presumptious. However, if money is in any way an issue, you might wonder where your 240 NIS went. The nose here is a sharp contrast to the Saint Juliens, as it leaps where the former swayed. The fruit is ripe in a stylish manner, so it never obscures the minerals. The palate is less rewarding - simply put, this is hardly as tasty as the Village. The minerals on the nose are pungent in a way that recalls gunpowder, and there are typical Cote de Nuits spices in the mix as well. Tasty, if not especially complex or stylish. Feels as though the body was bloated up to Premier Cru proportions. Surprising well done for 2003. I believe the Scottish Compay carries Drouhin, and I'd guess this is a 250 NIS wine. Ripe on the nose and palate, but the palate does back up the sweetness with structure and acidity. A little gamey on the nose. Tasty but still needs time. The official price for recent vintages is like 299 NIS, but savvy shoppers can probably find it for 250 NIS and less, when it suits the powers that be at WineRoute to offer a discount. Ripe with oddly tropical fruit and more than a hint of sea salt! So it's not the most balanced wine in the world, but it's vibrant and unique and I like. The following three wines are available from Burgundy Wine Collection for about 500 NIS each. Sweet red fruit, sweet spices, cocoa, sweat, minerals. Deft balance of sweetness of fruit and tannic backbone. Very tasty and even luxurious - I don't think Meo is capable of making a rustic Nuits, certainly not from Murgers. The nose here is, dare I say, even better than the Meo, with a hint of sea salt again. Juicy acidity, clean as a whistle fruit. Decent complexity. This is somewhat more complex than the Roncieres and the fact that it shows such complexity so early on might be a terroir thing. The nose is fairly ripe while the palate frames the juicy fruit with ripe acidity and a saline finish. Another great 2004 find! Red fruit, minerals and sweat meld on the nose. This isn't an easy wine to study right now - the palate is too ambiguous and backward, even if it presents enough interest for me to heartily embrace it. If you have a bottle, you know the drill - cellar it.